One road in and out of Berlin. Russians block the transportation routes into Berlin. Allies had to decide to give up Berlin or make other plans. U.S decided on massive airlift to supply life in Western half of the city. Massive public relations victory and a show of the U.S industrial might. A blockade was set up around Berlin in 1948, by which there was only one route in and out of the city. The Russians had shut down the various transportation routes into the city and the Allies had to decide whether they wanted to fight for Berlin. 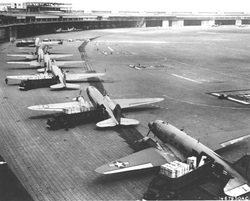 At the time, war was an option and the United States decided to set up a gigantic airlift to support the western half of the city. This decision represented a huge victory in Public Relations, and displayed the industrial might of the United States. Lastly, the North Atlantic Treaty Organization (NATO) was formed during this time.